I received an advanced readers copy of The Crossing by Michael Connelly through the Goodreads Giveaway program for FREE. This is the third novel I've read by Michael Connelly. I listened to and reviewed the audio versions of The Reversal and The Brass Verdict. Below is my honest, unbiased review of The Crossing by Michael Connelly. 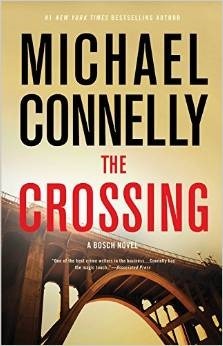 The Crossing by Michael Connelly is the 18th novel in the Harry Bosch Series. I enjoyed reading The Crossing by Michael Connelly. The storyline, characters, and plot are decent. But as much as I enjoyed reading The Crossing by Michael Connelly, I wasn't overly wowed by it. The first chapter, for instance, didn't hook me in right away and actually left me wondering what was going on. I actually didn't warm up to The Crossing by Michael Connelly until quite a few chapters into the novel... But then things took off and The Crossing by Michael Connelly picked up and kept me interested as to how things would finally turn out. I am giving The Crossing by Michael Connelly a rating of 3 stars out of 5 stars. Interesting. My husband has read all of his books and we have his newest one on hold at the library for him. I have only read one, The Late Show, in which he introduces a female detective. I liked it. Sorry this one did not work for you. I enjoyed reading the two previous novels I read by Michael Connnelly. Too bad this one didn't work for you. I follow a blogger who is a die out fan. Is it possible that you did not like it as much because you don't follow the series?